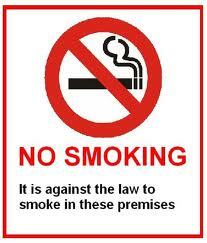 The Cayman Islands, Dominican Republic, Grenada, Trinidad, and Barbados are among the other Caribbean islands with smoking bans in place. Businesses will have six months to post "No Smoking" signs - and all tobacco products will have to include large graphic health warnings in addition to the text ones currently in use. Smokers who light up in public places could be fined $50,000 (appromimately $500 in U.S. currency), or imprisonment on conviction for a first offence. In the case of a second offence, the fines are considerably higher, as well as the imprisonment time. Jamaicans supporting the new law will hold marches Monday morning - the marches are being organized by the National Council on Drug Abuse (NCDA), the Heart Foundation of Jamaica, Jamaica Coalition for Tobacco Control and the Jamaica Cancer Society. Let me add - there has been a lot of discussion in online travel forums about this new policy in regards to the new tobacco smoking ban does not mentioning marijuana. While it is readily available on the island - and tolerated in many instances - travelers should be aware that it is illegal.